1 Assault Group Royal Marines is based on the edge of Poole Harbour, Dorset. The base was originally known as HMS Turtle and used for training of personnel for the Normandy D-Day landings. In 1954, its name became the Amphibious School Royal Marines, and later changed its name to the Amphibious Training Unit Royal Marines. 1 Assault Group Royal Marines are responsible for Landing Craft training. 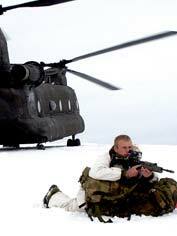 Fleet Protection Group Royal Marines is the only operational Royal Marines unit outside 3 Commando Brigade. The Group works through the Commander Operations to the Commander-in-Chief Fleet, and is primarily responsible for providing military support to undertake final denial of access to nuclear weapons. FPGRM is also responsible for a wide range of additional tasks worldwide in support of the Royal Navy.